Ultra is the highest known Unggoy rank. The Unggoy Ultra is the highest Unggoy rank seen so far in the Covenant military. Like Sangheili Ultras, Unggoy Ultras wear distinct white/pearl-like armor. Unggoy Ultras can sometimes be seen commanding groups of lower class Unggoy in battle, and are even seen leading black-armored Special Operations Unggoy into combat. Unggoy in this rank are rarely seen. 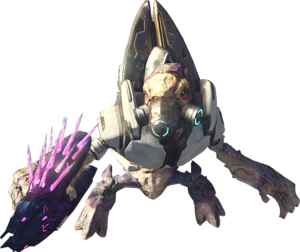 Unlike Sangheili Ultras, Unggoy Ultras do not appear to have any immunity with their command. It is just as likely that two or three will be encountered leading a small group of Unggoy, yet the Sangheili, (or Jiralhanae during the Great Schism) are ultimately in complete command; similar to the way that even Minor San'Shyuum outrank Sangheili Ship Masters. These Unggoy, like their lower-ranking cousins, appear in groups. They are very intelligent, making as few tactical errors as Sangheili Majors although that doesn't make them perfect. They usually display even more bravery in combat than even Special Operations Unggoy, and are more often used for specialized attacks, rather than generic military operations. In the post war period, the rank of Unggoy Ultra has been used at least once by Jul 'Mdama's Covenant. Unggoy Ultras usually throw more grenades and are far more accurate and deadly at a greater distance than the lower ranked Unggoy Majors and Unggoy Minors. They also wield Needlers with greater frequency than their inferiors, though it is still common for them to use plasma pistols, which they will overcharge. They can also take the same amount of damage Special Operations Unggoy do (more than three times as much as an Unggoy Minor can), but they are still vulnerable to headshots (even though it may take more than one for lower-end weapons). Like Special Operations Unggoy, they are rarely caught sleeping on duty. They still panic if they know that they are being overwhelmed, but are more likely to go berserk than panic - especially if one of their comrades was killed by a grenade. An Unggoy Ultra, compared to an average Unggoy Minor, can take much more damage and usually takes two to three melees instead of one to be killed, even on lower difficulties like Normal. Even on lower difficulties Ultras can still survive a headshot or two on account of their helmets. Unggoy Ultras are seen with two armor variants, one as a standard armor, with the exact same use with the harness other Unggoy are seen with, and the other one is with a cylindrical methane tank as well as a completely enclosed helmet, which enables the Unggoy to operate in vacuum areas. The said helmet would fall off after being shot at, saving the Unggoy from one single headshot. In all games, if the Thunderstorm skull is activated, all Unggoy will be upgraded to this rank. If one plays Halo: Combat Evolved with an unsupported video card, but has at least 32 megabytes of video memory, all armor colors will be white, with some exceptions such as the Mgalekgolo, which has led to some fans thinking that all the Unggoy in Halo: Combat Evolved are Ultras. However, white is the basic color of all models in the Halo: Combat Evolved engine. The models are rendered with no specific color until they are selected by an algorithm that determines which Unggoy variant to spawn, determined by the difficulty level (meaning higher difficulties are more likely to spawn Unggoy Majors) or colored by the actor variant and shader tags within the level/map cache file. There is a degree of randomness involved, as the player might notice an Unggoy Minor in one location die, then realize that it changes to an Unggoy Major. This is most noticeable when viewing maps with SparkEdit, a modding program. It renders all models based on their constituent bitmaps; the game engine adds the lighting effects and determines which variant to spawn when that part of the level is played. In SparkEdit, all models, except Mgalekgolo and Marines, have white armor, including Spartans. In Halo: Reach, Ultras have a cylindrical methane tank and a full face mask. The shape of the methane tank appears to have been influenced by early concept art for Halo: Combat Evolved, and designs later seen in the Halo Graphic Novel, Halo: Uprising, and Halo Wars. They have been nicknamed "Keg Grunts" by Bungie due to the shape of the methane containers. The helmet worn by Unggoy Ultras in Halo: Reach bears a remarkable resemblance to the Death Mask from the Mass Effect series. During the development of Halo: Reach, concept art of the Unggoy had inspired designers to give face masks to 80% of the Unggoy, and Bungie design lead Sage Merrill had set weapon damage to reflect the Unggoy's well-protected armor. Thus, a majority of enemy Unggoy required two headshots to be killed, creating an "unfun" experience as described by design lead Lars Bakken. Consequently, a change was made to remove the masks from almost all Unggoy units, with only Ultras retaining the mask in the final release. In Halo 2: Anniversary, two variants of the Unggoy Ultra are seen. The first bears a white-coloured standard combat harness, while the second is equipped with a white-coloured variant of the Special Operations combat harness. The default Unggoy character model in Halo: Combat Evolved. An Unggoy Ultra, as depicted in Halo 2. An Unggoy Ultra standing idle. Render of an Unggoy Ultra in Halo: Reach. Multiple Unggoy Ultras onboard the Ardent Prayer in Halo: Reach. One of the two Unggoy Ultra variants in Halo 2: Anniversary.